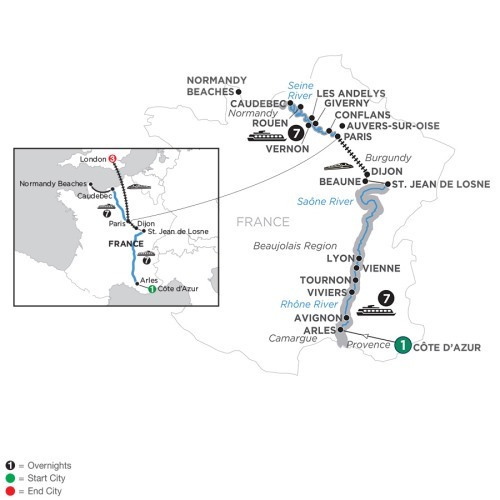 Take a high-speed train to Paris, and embark your second cruise ship to begin your journey along the Seine River into the picturesque Normandy region. In Vernon, choose between a guided visit of Claude Monet’s stunning gardens at Giverny or magnificent Bizy Castle. Continue to Les Andelys, home of dramatic Château Gaillard, then on to Caude-bec, where you’ll choose between an excursion to Normandy’s historic landing beaches or an interesting “Taste of Normandy” tour. Next up is Joan of Arc’s historic Rouen; and in Conflans, choose between excursions to Vincent van Gogh’s Auvers-sur-Oise or Napoleon and Josephine’s elegant Château de Malmaison. Return to Paris for guided sightseeing and take in the most famous sights of this magnificent city. Then, transfer to London for three exciting nights.